i've found this great website containing info on over 800 rated books. "Meet Rachel White, a young attorney living and working in Manhattan. Rachel has always been the consummate good girl- until her thirtieth birthday, when her best friend Darcy throws her a party. That night, after too many drinks, Rachel ends up in bed with Darcy's fiance. Although she wakes up determined to put the one-night fling behind her, Rachel is horrified to discover she has genuine feelings for the one guy she should run from. In her wildest dreams (or worst nightmare?) this is the last thing on earth Rachel could ever have imagined happening. As the September wedding date nears, Rachel knows she has to make a choice. In doing so, she discovers that the lines between right and wrong can be blurry, endings aren't always so neat, and sometimes you have to risk all to win true happiness. 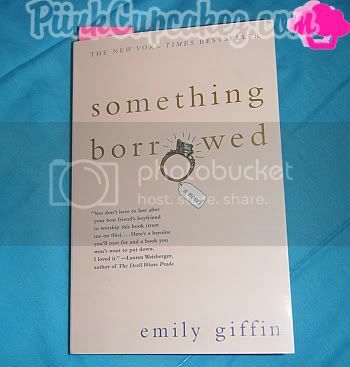 Something Borrowed is a phenomenal debut novel that will have you laughing, crying, and calling your best friend." Chicklitclub is one of my favs! Although every time I go to check it out, I end up planning on making a trip to the bookstore with a long list! I know....I'm a nerd!! Thanks for the tip. I'm always looking for new books to read. I love this book! I read the rest of the series, Something Blue & Baby Proof...both were incredibly hard to put down! Check em' out, you should love them if you like Somthing Borrowed. I love reading and this sounds like it has a whole mess of drama. So I'm gonna check it out. The Duchess, it's a hard read!